Typewritten Manuscript, twenty-one pages, large quarto, [Washington, D.C.], November 1, 1946. Entitled Memorandum on the Organization of Staff Assistance to the President. With corrections comprising seventeen words in Harry S Truman’s hand in red crayon (shown in italic), and with corrections in the hand of Dr. John R. Steelman in ink (shown in square brackets). Bearing in the upper right corner the stamp, SECRET, which has been deleted, and an authorized notice in the lower right corner that the memo has been DECLASSIFIED on September 16, 1994. Together with an Autograph Note Signed of Truman to Steelman, with his initials, one page, small octavo, on printed stationery of Angelica Washable Uniforms. In his note forwarding the manuscript, Harry S Truman writes, as president: “Memo to Dr. Steelman. John, please go over this for me and see if any bugs are in it. H.S.T. If O.K. return & I’ll sign.” Steelman was an economics professor and labor specialist from Alabama who became Truman’s presidential assistant from 1945 to 1952. 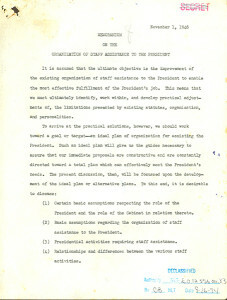 The manuscript, which discusses in detail the president’s responsibilities, especially in relationship to his cabinet and staff, reads in part: “It is assumed that the ultimate object is the improvement of the existing organization of staff assistance to the President to enable the most effective fulfillment of the President’ job. This means that we must ultimately identify, work within, and develop practical adjustments of the limitations presented by existing statutes, organization, and personalities. To arrive at the practical solutions, however, we should work toward a goal or target-an ideal plan of organization for assisting the President. Such an ideal plan will give us the guides necessary to assure that our immediate proposals are constructive and are constantly directed toward a total plan which can effectively meet the President’s needs. The present discussion, then, will be focused upon the development of the ideal plan or alternative plans. To this end, it is desirable to discuss: (1) Certain basic assumptions respecting the role of the President and the role of the Cabinet in relation thereto. (2) Basic assumptions regarding the organization of staff assistance tot he President. 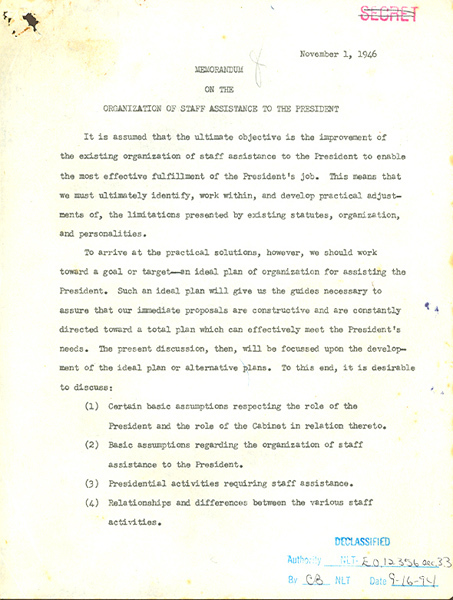 (3) Presidential activities requiring staff assistance. (4) Relationships and differences between the various staff activities. “I. The role of the President. 1. The President, as President, fulfills at least five major responsibilities: a. As He is leader of a political party / b. As ceremonial head of the Nation / c. As chief of the Executive Branch of the Federal Government / d. As Congressional leader / e. As leader of the Nation. Leadership of a political party involves certain relationships and organization patterns somewhat separate and distinct from the President’s activities as President. It is a special line of communication with, and responsibility to the people; it is a special aspect of his broader role as leader of the Nation. end Excluding this specialized aspect of the President’s public leadership, the five responsibilities are essentially overlapping facts of the President’s job as Chief Executive of the Nation end and the problem of staff assistance will be treated in terms of this single job of National Chief Executive and National leader. are now problems of the national Government for which the President, as national leader must provide answers. End of This is a sharp change. In this country, the President, as an individual, is the Chief Executive. end See p 7.
a national total-need basis by the Chief Executive. the President must develop the overall policy formulation and must lead, guide, and coordinate, his cabinet. Cabinet members can deter, rather than facilitate the fulfillment of Presidential responsibilities. The President must look upon specific proposals stemming from them in terms of whether they are responsive to the broader national policy objectives he has formulated. a substantial degree of autonomy and independent outlook. This is a further reason why they cannot function as staff assistants responsive to the requirements placed on the President for leadership in his respective capacities. 8.
the President must continually protect the exercise of his role against the inroads of his Cabinet. to exert positive leadership. 9.
he must guard against legislation which attacks, piecemeal, various segments of the President’s responsibility. To curb such inroads on Presidential leadership, the adequate development of staff facilities to the president is needed. “There is serious danger in setting Under our system you cannot set up anything equivalent to an Assistant-President to share in the President’s responsibilities. There are many competing forces at work in our national scene [that it would not work]. for assistance on any type of matter which may confront him. provide an overall or Government-wide perspective. give the President judgments from several different points of view. given basic assignments in a specific segment of the total staff responsibility. 6. The organization of staff facilities around the President should be flexible. The decisions should always be the President’s decisions. 8. The staff must function as a team. including significant political administrative, economic, social, cultural and other major substantive trends and developments. Secondly, the President’s staff must furnish advice and information to him which will enable the President to make timely determinations on the need for Presidential action. the President’s staff itself must be particularly responsive to the President’s leadership and direction. “III. Presidential Activities Requiring Staff Assistance. First, he must formulate strategic policies and objectives. he must decide on the elimination of certain economic controls and the substitution of other policies. In general, he must identify certain broad objectives and then choose between and blend together a number of specific policies for the realization of such objectives. ; and (d) the formulation of broad administrative policies and practices. in terms of how the President spends his time, we find that [he] must: (1) See people. appoint key executives and various political incumbents. (4) The President must deal with the press and the radio. send messages and make speeches. pass upon various official documents particularly legislation and Executive orders. The President must have staff assistance in performing all of these activities. “IV. Relationships and Differences between Staff Activities. In formulating policies and objectives, staff must always be closely attuned to the President. be the personal choice of the President. Under the heading of administration, we find four types of staff activity already enumerated-program formulation and coordination, the development of administrative machinery, the coordinated gathering of systematic intelligence, and the stimulation of a high caliber career civil service. to group these activities under a common leadership.